This Kitchen Butler is designed to give you the space to prepare, and the storage essential for gourmet food preparation. Wood top includes an inset dark green granite cutting board that is ideal for cutting or pastry prep, and is easily removed for cleaning to keep your work surface sanitary. 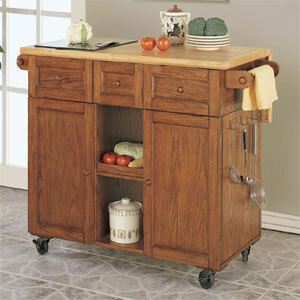 Drop leaf portion of wood top can be used as a breakfast bar or for additional prep space. Tons of storage space which includes a removable knife block, a multi bin drawer with lift-out tray, a spice rack, two open shelves, towel holders, hooks for potholders and utensils, and hidden storage for a trash can or for cookware. Strong Construction. Some assembly required.